A shocking 80% of antibiotics sold in the U.S. are used not by humans, but by the meat and poultry industries, making factory farm animals grow fatter faster and enabling them to survive crowded and unsanitary conditions. The facilities and feedlots where these cows, chickens, and pigs live are teeming with antibiotic-resistant bacteria that make their way into the air, the water, soil, your food, and you. Unfortunately, the Food and Drug Administration has done little to protect us, so now it’s time for consumers to act. 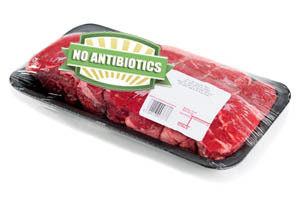 That’s why the Center for Food Safety is supporting the Meat Without Drugs campaign, and we’re starting where we can have the most impact – our neighborhood supermarkets. Join us in urging Trader Joe’s to lead the way in getting antibiotics out of our food chain by selling only meat raised without antibiotics!